My next novel, The Outcasts of Time, will be published under the name 'Ian Mortimer', not James Forrester. There are two main reasons for this. First, this isn't a Clarenceux novel, nor even a genre novel; in fact there has never been anything quite like it, so far as I know. Second, it includes two medieval characters who travel in time. The combination of the medieval and the time-travel elements mean it really has to be an Ian Mortimer book. It will be published in the UK by Simon & Schuster, in June 2017. Further information will appear on the Ian Mortimer website in due course. My American publishers, Sourcebooks, are running a promotion all this month (April 2013). If you pre-order the second volume of the Clarenceux trilogy, The Roots of Betrayal, you can download a copy of the first book, Sacred Treason for free. To get the free ebook, you should email proof of the preorder to sbpublicity@sourcebooks.com before 30 April; you will then receive a code to download the book through the publishers' website, sourcebooks.com. Today I finally updated this website, so all the links should all now be working. Last weekend I went to Copenhagen, Denmark, to do some interviews as James Forrester at the book forum, courtesy of my Danish publishers, Jentas. The USA edition of Sacred Treason has been published by Sourcebooks, with some very kind and enthusiastic comments from American bloggers. Comments from UK readers on The Final Sacrament have been equally positive, which is most gratifying. Now it is time for me to turn back to being Ian Mortimer for a while - rather than James Forrester - filming a TV series based on my Elizabethan Time Traveller's Guide, writing a book about social change in the western world, and doing some more appearances and talks. One hundred signed copies of the first ed. of the tthird Clarenceux novel, The Final sacrament, are available in Goldsboro Books, Cecil Court, London. Forty of them are also lined and dated. Staff tell me that there are still a handful of the signed 1st ed. copies of the first and second books too. The first Clarenceux novel, Sacred Treason, will appear in the USA on 1 October, published by Sourcebooks. 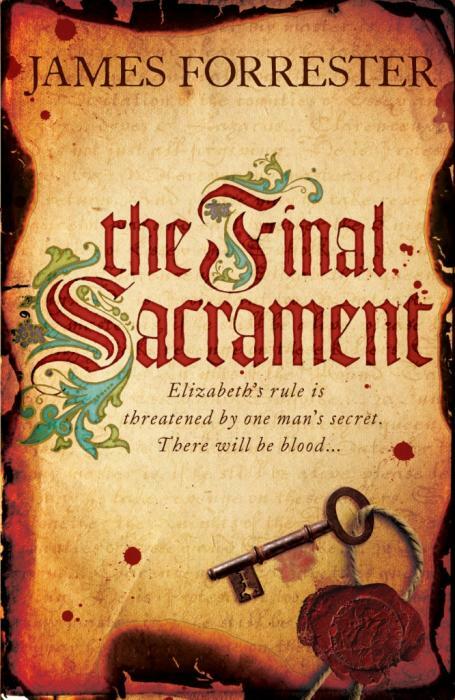 The third and final Clarenceux novel, The Final Sacrament, went to the publishers yesterday. Due to appear on 16 August. For a preview of the cover of the third and final Clarenceux novel, click here. Why use a different name for historical fiction? I have now been asked this question so many times that it seems sensible to write a note on this. The third and final volume in the Clarenceux trilogy is due to be published in July 2012. Click on 'forthcoming books' for a synopsis. And, moreover, published beautifully by Domino. It is entitled Svata Zrada. I really like the sound of that - Svata Zrada! The day has arrived. Book no. 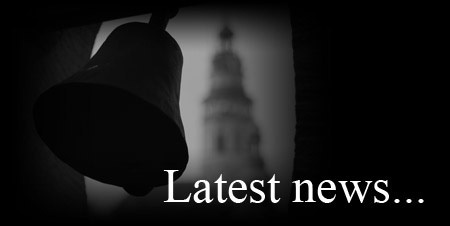 2 hits the shops and goes live online (for those who like their stories electronically). Other news: Sacred Treason will be published in Latvia by Kontinents. The Danish edition, published by Jentas and entitled Helligt Forroederi is now out. Spent the morning signing and dating one hundred first editions of the hardback of Roots of Betrayal at Goldsboro Books in Cecil Court, London. About half also have the last line written in full, the remainder have the Carew family motto (one of the main characters being a Carew). Anyone who wants a collectors edition should either contact Goldsboro or, in due course, enquire at Waterstones (Exeter High Street branch), where I will sign some copies in the near future. The third instalment of Clarenceux's battle against his own inner demons, the State, and Catholic conspirators has been agreed and will be written at the end of the year. This volume, which has the working title The Final Sacrament will conclude the drama. All being well it should appear in 2012. Polish translations of Sacred Treason and its sequel, The Roots of Betrayal will by published by Wydawnictwo Albatros in 2012. Editions of Sacred Treason will appear for Denmark and the Czech Republic. Jentas will be publishing the Danish translation, Nakladatelstvi Domino the Czech one. W.F. Howes published the English-language audiobook in December. The publication date for the paperback has shifted to 14 April 2011. Last but not least, the Kindle edition is available now from amazon.co.uk. Yesterday I signed copies of the first edition of Sacred Treason at specialist bookshop, Goldsboro Books in Cecil Court, London. Most were signed and dated, some include the last words from the book handwritten on the title page ('...the last word is hope') and a few have the whole last line written by me ('In all our struggles, the last word is hope'). Unless you live in Exeter or catch me at Reading or Appledore festivals (where I will be appearing as James Forrester), Goldsboro Books is the only place you are likely to be able to find a signed first edition of Sacred Treason. A couple of more reviews have also appeared - check the reviews section. A short review of Sacred Treason by Chris Simmons appears in the new edition (September) of the online crime fiction magazine Crimesquad, together with an interview. A short review of Sacred Treason by Laura Wilson appears in the crime round-up. A short piece (500 words) by me appears alongside a piece by A.N. Wilson 'The best is history' in today's paper. An article by me entitled 'The lying art of historical fiction' appears in The Guardian. It's Book of the Month in Waterstones, and available in all good bookshops (as they say...).